University of Alabama issued the following announcement on Feb. 28. It is Read Across America week, and a room full of 5-year-olds echoes with Dr. Seuss-themed songs. There is singing, dancing and a smile on every child’s face. On the surface, this appears to be a fun, interactive music class. But it is so much more. Dawn Sandel, music therapist at the RISE Center, leads a sing-along with students. The University of Alabama RISE Center is an early childhood education facility that provides educational experiences for children with special needs, alongside traditional learners ranging from eight weeks to five years. Dawn Sandel is a full-time music therapist at the RISE Center. Her role involves targeting the therapy goals of students with special needs through music and other creative activities. Sandel leads large group therapy sessions several times a week and small group sessions once a week. The sessions are always different, as Sandel usually plans songs and activities along weekly lesson themes, such as shapes. RISE students participate in numerous activities to help achieve their therapy goals. Sandel regularly collaborates with the RISE Center therapist team, which includes a physical therapist, occupational therapist, and speech and language pathologist, in order to plan sessions that will assist the children in working toward their goals. 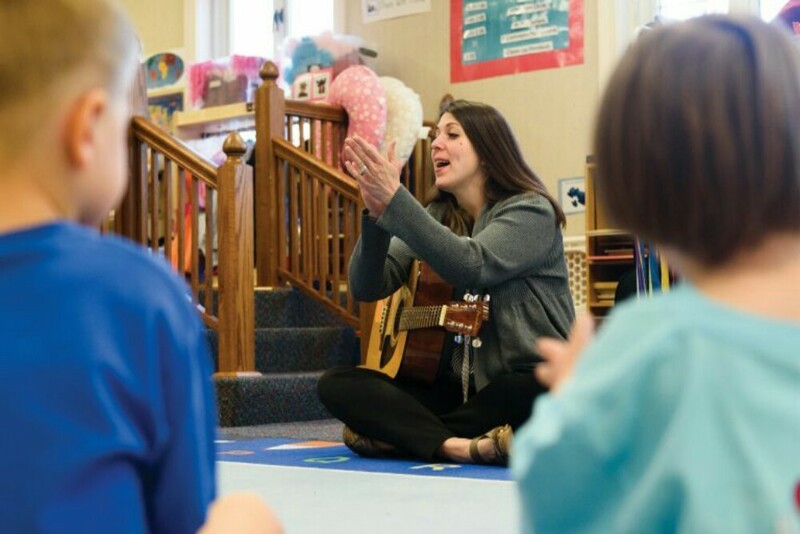 In addition to serving as full-time music therapist, Sandel leads the RISE Center bell choir, the annual graduation program, and the RISE and SHINE play group program. RISE and SHINE was put into place to increase services available to children and their families. The play group program enables families of children with special needs to receive services and assistance that might otherwise be inaccessible to them.